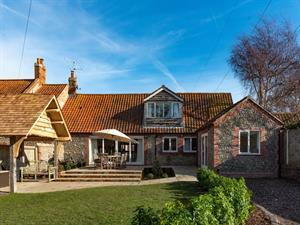 Boat Barn Cottage01263 715779work01603 870304fax Self-cateringBeautifully presented, this exceptional property is a true hidden gem tucked away yet right in the heart of Blakeney and only moments from the quayside. The vast open plan living space overlooks the landscaped garden with a summer house, the majority of bedrooms are on the ground floor and there is a second sitting room set up with a cable for gaming. The master suite on the first floor has lovely views across the salt marshes to the sea. In two of the bedrooms, beds can be made up as twin or double rooms. Unusually for a Blakeney holiday home there is plenty of off-street parking too. Other: Towels. High chair, travel cot and stairgate available. Hairdryer. Books and games provided. Outdoors: Enclosed rear landscaped garden with summer house, table, chairs and gas barbecue. Beautifully presented, this exceptional property is a true hidden gem tucked away yet right in the heart of Blakeney and only moments from the quayside. The vast open plan living space overlooks the landscaped garden with a summer house, the majority of bedrooms are on the ground floor and there is a second sitting room set up with a cable for gaming. The master suite on the first floor has lovely views across the salt marshes to the sea. In two of the bedrooms, beds can be made up as twin or double rooms. Unusually for a Blakeney holiday home there is plenty of off-street parking too.